It was interesting to watch the openings to the Olympics and the Paralympics. The Olympics opening appeared to be about primarily England and nationalism, whereas the Paralympics was a positive statement about humanity and what we all share. I had mixed feelings about this statement. Yes, it was great to hear that disability is ‘cool’. But will the Paralympic legacy result in the general public and politicians describing people with disabilities as ‘cool’ next year when Disability Living Allowance is cut back? The process of applying for DLA is traumatic enough at the moment. The stress being caused by worries about cutbacks can only be described as cruel. Politicians are supporting the Paralympics and so is the Media. They are using the Paralympics too. Let’s hope that they continue to support disability going forward, post games. Let’s hope that they understand the obligation to protect and support humanity and what we all share. 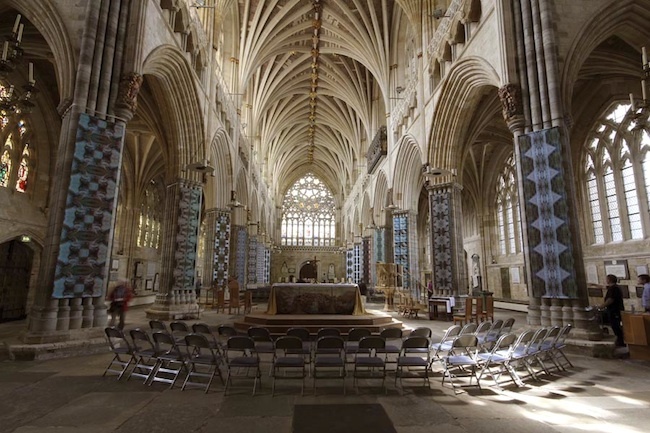 Mark Ware’s exhibition of the Cathedra 900 3D artwork banners at Exeter Cathedral has been extended until 30th September 2012. I don’t like to refer to myself as a ‘disabled artist’. ‘Disabled’ suggests to me something that has been rendered safe or useless. But I can’t deny what a wonderfully liberating effect disability has had on my way of thinking and upon my art. Before my stroke in 1996 I used to rush from A to B and not notice the gap that divides those letters. Most thoughts were in the past or in the future and, in retrospect, not much lay in between. If it rained, I would run from one building to another or, from a car to my destination, in order to avoid getting wet. To avoid ‘bad weather’. Now, due to my stroke. I can’t rush or run. When it rains, my pace remains the same. And instead of attempting to avoid the rain, I choose to embrace and accept it. I’m lucky. Because I no longer experience bad weather. 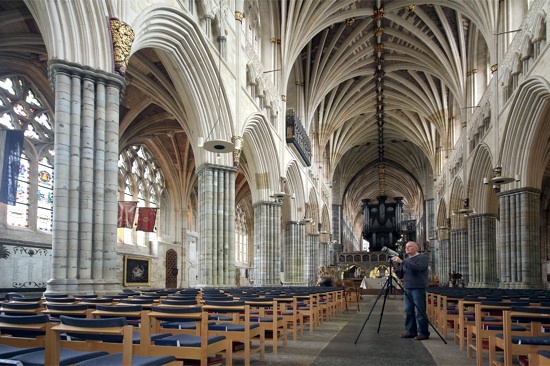 During my time in Exeter Cathedral working on photographic studies for the Cathedra 900 project, parts of the UK have had their wettest weather since records began. And yet, in the Cathedral the light has been beautiful no matter how dark the skies have been outside. My visual impairment varies from hour to hour, but even when it’s at its worst I can appreciate the Cathedral’s light as it alters continually throughout the day. This is something I hadn’t fully anticipated at the beginning of the Cathedra 900 journey. But it has had a profound effect upon the work I’ve produced. I began by thinking about outcomes, the future, and potentially profound thoughts. But as I shot dozens of images, I began to realise that what I was seeking was in front of me, in the here and now. Light, colour, movement, sound, smell and touch. In most gallery spaces the walls are white and the light is controlled and visitors are guided regarding where to stand to view work. You know what to expect before you go to them. In the Cathedral it’s all very different. The changes in light and sound in particular dramatically alter the experience of viewing the 3D banners. Since the exhibition began, I’ve visited the Cathedral several times and on each occasion the exhibition has looked different. The show has now been extended until the end of September and it’ll be interesting to discover how the slight change of season will further affect the artwork. My 3D artwork banner exhibition is now on show in Exeter Cathedral’s Nave until 31st August 2012. 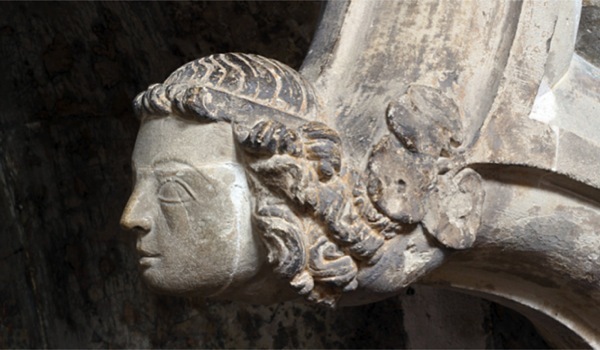 The exhibition is made up of twenty eight 3D images that are hanging from the Cathedral Nave’s fourteen giant columns. Visitors experience the 3D effect by using red/blue 3D glasses. The 3D technique is called ‘anaglyph’ and dates back to the 1850s. I’ve created 3D anaglyph images for the past 35 years. I was taught 3D photography by the late Northumbria University lecturer, Alistair Park. Alistair was a 3D photography expert, but at the time of teaching me 3D, he was blind in one eye caused by a road accident. This meant that he could no longer see in 3D. It is ironic that I’m now exhibiting a 3D exhibition that, due to my stroke, I can’t experience in 3D most of the time. My stroke affected the convergence of my eyes which causes double vision. In turn, this means that my brain can’t always blend left and right images to create 3D vision when convergence fails. As a result, during the creation of the Cathedral 3D banners I’ve regularly had to rely on my wife Sara and my daughter Kelsey to confirm that what I’ve produced is in 3D. When this happens I regularly think about Alistair Park. Over recent years I’ve been involved with supporting Interact Reading Service and The Stroke Association, two charities that help people with stroke. I do so as a result of my experiences as a stroke survivor. This year I was pleased to be invited by the Stroke Association to help judge the art category for its Life After Stroke Awards 2012. The winner we chose was Angus Igwe. He was presented with his award in London on 20th June. Angus is 60 and had a stroke in June 2006 which left him with a number of physical disabilities including the loss of use of his right arm. His only words are ‘yes’ and ‘no’ and he is unable to write. Prior to his stroke, Angus was a psychotherapist. It is only since his stroke that he’s become interested in painting and he paints after adapting to using his left hand. Judging the eight Stroke Association art nominees was an extremely difficult task. It was not possible to separate the art works from the very moving stories that resided behind them. Seeing Angus’s art and meeting him was inspiring and has put a lot of things in perspective for me, including why I create art and the nature of art’s importance to the human condition. Beginnings are strange things, aren’t they? Cathedra 900 began with thoughts about sea waves and the work of the Russian artist, Alexander Rodchenko. Several months ago I saw a T.V. programme about sea waves. It explained that out at sea, waves don’t move. Rather, it is energy that moves. Proof can be seen when a floating object bobs up and down on water as energy passes under it. This led me to think about other forms of energy, including the potential energy within the structure of a Cathedral building. I’d read that the weight of each of the World Trade Centre (Center) has been estimated to have been 500,000 tonnes. Someone told me last year that the vault ceiling in Exeter Cathedral weighs over 70,000 tonnes. These are staggering figures. And yet buildings do not visibly reveal this type of information. It struck me that if we could speed up time and witness 900 years of the life of Exeter Cathedral building within a few minutes, we would be able to see evidence of its energy. Ian Edwards, a friend, commented: "I always remember an old Physics teacher defining potential energy as something that has the potential to do useful work because of its position." The example he gave was of a brick (or bricks) pulling a bucket up a well. 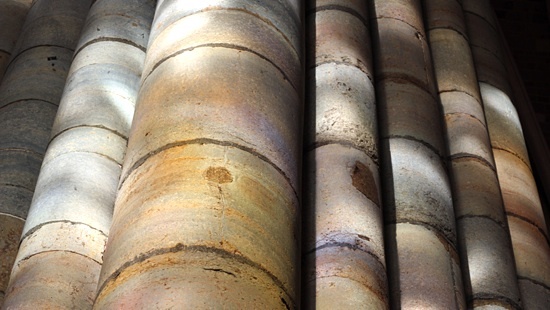 70,000 tonnes of stone could pull a great many buckets up wells! At the beginning of Cathedra 900, Rodchenko was also in my thoughts because of books about his work I’d recently bought. Since being an art student, Alexander Rodchenko’s work has influenced my own art. I’m particularly drawn to his poster designs and drawings. The first I saw of his posters were those designed for the film, ‘Battleship Potemkin’. I’m fascinated by the wonderfully dynamic, direct and expressive work of the Russian avante-garde artists of the early 20th century. Under the guise of nationalistic propaganda they managed to subversively explore and extend the boundaries of contemporary art of that time. Although the 3D banner artwork for Exeter Cathedral does not directly mirror the style of Rodchenko’s work, it does echo the way in which his work often offered more than one layer of interpretation. The 3D banners reveal different meanings depending on how close people stand to view them. All of my photographs are tagged with disability. Since January I’ve taken several hundred digital photographs for the Cathedra 900 project at Exeter Cathedral. This is in preparation for the 3D exhibition that will run from 23rd July until 31st August. From the outset I’ve catalogued each shot for easy access at a later date. But what I hadn’t reckoned on was how my disability would help with this process. I had my stroke over 16 years ago. It impacts upon every aspect of my life, every minute of every day. Its affects include visual impairment, mobility problems, continual dizziness, feelings of intense nausea, pain that can be almost unbearable at times, memory problems, emotional swings, confusion and so on. Overall, in my case, my disability is a ‘multimedia’ experience. I mention this because, strangely, it has been of positive use in helping me catalogue my photography. I never feel well and so everything I do involves an enormous amount of illness and a great amount of determination to overcome it. That results in me not taking anything for granted and it also means that I intimately remember exactly where and when I was when I took each of the photographs I’ve taken at the Cathedral. I can even recall temperatures and smells. For example, in order to take the accompanying photo, I set the tripod low and had to kneel on a stone floor and bend over to look through the camera’s viewfinder. The kneeling caused searing pains in my knees and back, and bending over caused great feelings of nausea and dizziness. The day was cold and it was raining outside. The stone floor was cool to the touch and had a distinct smell. The light level in the Cathedral was very low (the above photograph had a 30 second exposure set at f22) and the small number of visitors that day resulted in barely perceptible whispering sounds of conversations spread throughout the building. Supported by Arts Council England and Exeter Cathedral, Cathedra 900 is an enormously exciting project for me. This year the earliest part of Exeter Cathedral will be around 900 years old. Cathedra 900 will be a celebration and an artistic interpretation of the time line of the Cathedral building. I'm fascinated by many aspects of this building and its impact over centuries. Erosion and additional construction of the building throughout the centuries have dramatically altered its personality. I'm also drawn to the idea of the Cathedral being an 'observer', looking down on the people and the surrounding landscapes below since 1112. Following my stroke during 1996 all of my artwork has been related to various forms of disability in some way. In my case stroke badly affected both my physical and cognitive abilities. And so, I‘m now multi-disabled. Although I don’t welcome my disability, I value the impact it has had on my art and the insight it offers me into other conditions. I perceive the world in a different way because of my disability, therefore it’s inevitable that my artwork reflects that fact. Cathedra 900 is a tremendous challenge, but also an incredible opportunity to work on art that will be steered in a way largely of my choosing. I can’t ask for more. On a day-to-day basis, my condition presents obstacles, particularly with mobility and feelings of nausea, pain and dizziness which can be overwhelming at times. The Cathedra 900 project is multifaceted, and organising the many aspects can be daunting. Even carrying out simple tasks such as taking photographs in the Cathedral can be problematic because of the side-effects of my stroke, including visual impairment. But like many people with disabilities, I find enormous satisfaction in overcoming these obstacles. And in doing so, the work itself becomes more valuable. At this stage, the twenty eight large scale 3D banners are in development and production for the exhibition in the Cathedral Nave from 23rd July 2012 until 31st August 2012. A Cathedra 900 website will be completed soon, after which details will be announced regarding Cathedra 900 creative workshops, online art exhibitions, creative writing, a multi-channel sound installation and a multimedia live event to be staged in the Cathedral Nave during March 2013. I’ll be updating this blog to document progress as the project develops, and looking at some of the aspects of the work in more detail. If you can find time, I would very much appreciate feedback as the project develops.